French food has always been a bit hard to come by in Salt Lake City. When I first moved here in the early '90s, the only game in town was the late Max Mercier's Le Parisien restaurant, which featured continental fare like escargot and Chateaubriand. Le Parisien never offered cutting-edge cuisine but provided comfort and warmth with every meal. Then there was the short-lived Tenderfoot, a French bistro opened in Heber by Mercier's nephew Jeannot Mercier. It was far ahead of its time for Heber diners—an era when few Americans even knew what frites meant. Then it started to seem, in the mid 2000s, that the French bistro and brasserie movement so popular in New York City (Balthazar, Park Bistro, Les Halles, Pastis, et al) was finally taking root here. Au Bon Appetit, where Takashi is now located, hit all the right notes, as did L'Avenue Bistro (now home to The Dodo) across from Sugar House Park. Both are gone, but not forgotten. To my knowledge, the only bona fide French restaurant still standing in Salt Lake City is Eric DeBonis' The Paris Bistro & Zinc Bar, which has survived our sometimes-fickle palates and Americans' love/hate relationship with all things French (remember "freedom fries?"). Having dined at The Paris recently after skipping it for a year or more, I must say that not only is the restaurant surviving, but it's thriving. I don't think it's ever been better. Maybe that's because of DeBonis' and Chef Emmanuel Levarek's renewed commitment to French fare. For a while, Italian and Mediterranean dishes crept onto The Paris' menu, and fans of French food—me included—felt a little cheated. 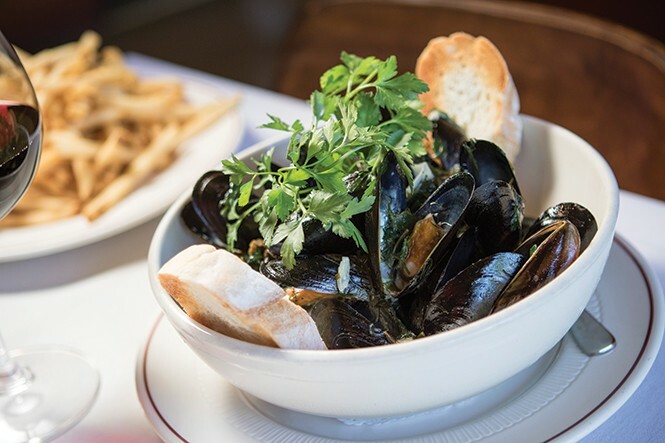 With the opening of DeBonis' Sea Salt restaurant, which features Italian and Mediterranean flavors, The Paris kitchen was able to again focus on classic and contemporary French cuisine and all was right with the world. The Paris menu is so chock-full of temptations, it was hard for me to narrow it down to just a few dishes to enjoy and share. I want the charcuterie plate, but if I order that, and the foie gras de canard au torchon, the sweetbreads and the duck confit, will I wind up with gout before the evening's out? And, I love the steamed moules marinière ($18.95), but the clams in white wine ($16.95) with San Marzano tomatoes, garlic and sorrel sound great, too. Should I order the all-natural, wood-oven-roasted Mary's chicken ($26.95) or the steak au poivre with pommes frites ($19.95)? The solution, of course, it simply to eat at The Paris more often—which is definitely on my to-do list. Allured by the special Menu de Saison, we enjoyed a trio of tartine de chèvre aux fèves et radis—thick, toasted baguette slices smeared with a purée of fresh goat cheese and fava beans with radish slices, chervil and a drizzle of olive oil; it was a beautiful beginning. Next came a serving of the best pea soup I've ever had: a gloriously fresh bowl brimming with the spring flavors of English peas, fava beans, chives, mint, chervil and crème fraîche ($6.95). Then, remembering I have a physical scheduled for next week, I allowed sanity to prevail and passed on the foie gras, escargot and charcuteries in favor of my single favorite food on the planet: veal sweetbreads ($18.95). Chef Levarek, who hails originally from Paris, knows what to do with sweetbreads. His ris de veau à la Grenobloise is a generous serving of tender, melt-in-the-mouth, pan-seared sweetbreads, lightly butter-browned, with a heaping helping of fresh chanterelles, and classic caper-lemon-parsley sauce. Screw gout. My wife and I were enjoying glasses of Beatrice Defresne Bourgogne Chardonnay ($9.95) and superior table service by the Paris staff and especially our server, another Parisian named Du Bois, when I spied a familiar face. Those who've been around long enough to remember the aforementioned Le Parisien restaurant will probably also remember the backbone of Max Mercier's service staff: a woman named Flo. Well, Flo is still doing what she does best—nurturing customers like they were her own kids—but now she's doing it at the Paris. Levarek says of Flo, "That's our matriarch!" With our French server, Du Bois, and the French Chef Levarek in the kitchen, I began to feel like I was back in France myself. Somehow, The Paris Bistro manages to capture and shine on its customers that special light that the City of Lights is so well known for. And we hadn't even enjoyed our entrees yet. Call me predictable, but I can't walk into The Paris without ordering confit de canard aux lentilles du Puy ($19.95). It's a perfect dish of duck confit made in-house, with tiny, dark Puy lentils, wilted spinach and oyster-mushroom confit with fresh thyme in a scrumptious natural broth. The duck: crispy and browned skin with falling-off-the-bone tender confit meat within. It's a beautiful thing. The missus ordered Moroccan-style salmon ($28.95) and it, too, was spectacular. I'd never encountered salmon with Moroccan spices and flavors before, but it's something I'll be trying to replicate at home: grilled Scottish salmon with spicy harissa and vegetable-olive couscous. Yet another winner. Tempted by desserts like the banana and Nutella crepes; bananas Foster; and strawberry mille-fueille with whipped cream, we finally settled on something a tad lighter: lemon grass crème brûlée ($8.95). It was wonderful, but we weren't done yet. Having learned that it was recently my birthday, the kitchen sent out a fabulous apple-stuffed crepe, caramelized with Calvados, sea salt, crème fraîche and a candle on top. I looked around and, for a moment, thought I was sitting in the shadow of the Eiffel Tower.